Loremasters are the sages of the dwarvish race. 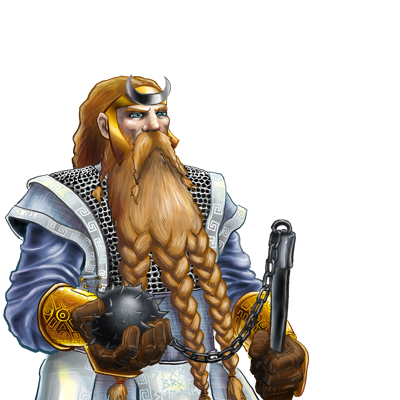 Their counsel is greatly valued by war-leaders and chieftains, and they are viewed with awe by ordinary dwarves, for they alone have plumbed the deepest and most closely-held secrets of dwarven knowledge. It is said that where a loremaster stands, there is the soul of the dwarves. To the abilities of the Annalist they add a limited ability to heal. Special Notes: This unit is able to slow its enemies, halving their movement speed and attack damage until they end a turn. This unit is capable of neutralizing the effects of poison in units around it. This unit has magical attacks, which always have a high chance of hitting an opponent. This unit is capable of basic healing.